POJO Cache is an in-memory, transactional, and clustered cache system that allows users to operate on a POJO (Plain Old Java Object) transparently and without active user management of either replication or persistence aspects. JBoss Cache, which includes POJO Cache, is a 100% Java based library that can be run either as a standalone program or inside an application server. This document is meant to be a user and reference guide to explain the architecture, api, configuration, and examples for POJO Cache. We assume the readers are familiar with both JGroups and the core JBoss Cache usages. If you have questions, use the user forum linked on the JBoss Cache website. We also provide tracking links for tracking bug reports and feature requests on JBoss Jira web site . If you are interested in the development of POJO Cache, post a message on the forum. If you are interested in translating this documentation into your language, contact us on the developer mailing list. JBoss Cache is an open source product, using the business and OEM-friendly OSI-approved LGPL license. Commercial development support, production support and training for JBoss Cache is available through JBoss, a division of Red Hat Inc. The section lists some basic terminology that will be used throughout this guide. Aspect-Oriented Programming (AOP) is a new paradigm that allows you to organize and layer your software applications in ways that are impossible with traditional object-oriented approaches. Aspects allow you to transparently glue functionality together so that you can have a more layered design. AOP allows you to intercept any event in a Java program and trigger functionality based on those events. JBoss Aop is an open-source Aop framework library developed by JBoss. It is 100% Java based and can be run either as a standalone or inside an application server environment. More details can be found at www.jboss.com. PojoCache uses JBoss Aop library in two ways. It uses JBoss Aop firstly for its own interceptor-based architecture and secondly to realize the fine-grained replication aspects. Dynamic Aop is a feature of JBoss Aop that provides a hook so that a caller can insert event interception on the POJO at runtime. PojoCache currently uses this feature to perform field level interception. JGroups is a reliable Java group messaging library that is open-source and LGPL. In addition to reliable messaging transport, it also performs group membership management. It has been a de facto replication layer used by numerous open-source projects for clustering purposes. It is also used by JBossCache for replication layer. 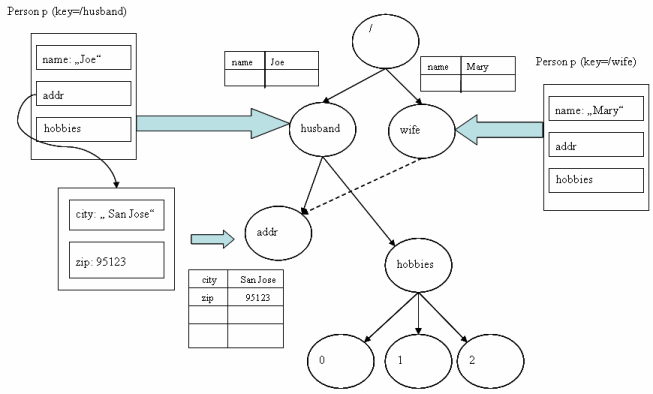 Core Cache is a tree-structured, clustered, transactional cache. Simple and Serializable java types are stored as key/value pairs on nodes within the tree using a collection-like API. It also provides a number of configurable aspects such as node locking strategies, data isolation, eviction, and so on. POJO Cache leverages Core Cache as the underlying data-store in order to provide the same capabilities. Annotation is a new feature in JDK5.0. It introduces metadata along side the Java code that can be accessed at runtime. PojoCache currently uses JDK50 annotation to support POJO instrumentation (JDK1.4 annotation has been deprecated since release 2.0). Prepare is a keyword in JBoss Aop pointcut language used to specify which POJO needs to be instrumented. It appears in a pojocache-aop.xml file. However, if you can use annotation to specify the POJO instrumentation, there is no need for a pojocache-aop.xml listing. Note that When a POJO is declared properly either through the xml or annotation, we consider it "aspectized". Instrumentation is an Aop process that basically pre-processes (e.g., performing byte-code weaving) on the POJO. There are two modes: compile- or load-time. Compile-time weaving can be done with an Aop precompiler (aopc) while load-time is done to specify a special classloader in the run script. This step is necessary for an Aop system to intercept events that are interesting to users. Objects do not need to implement Serializable interface. Instead they are instrumented, allowing POJO Cache to intercept individual operations. Replication is fine-grained. Only modified fields are replicated, and they can be optionally batched in a transaction. Object identity is preserved, so graphs and cyclical references are allowed. pojo.setName("some pojo"); // This will trigger replication automatically. Use attach() to put your POJO under cache management. Operate on the object directly. The cache will then manage the replication or persistence automatically and transparently. More details on these steps will be given in later chapters. Since POJO Cache is a layer on-top of Core Cache, all features available in Core Cache are also available in POJO Cache. Furthermore, you can obtain an instance to the underlying Core Cache by calling PojoCache.getCache(). This is useful for resusing the same cache instance to store custom data, along with the POJO model. Fine-grained replication. The replication modes supported are the same as that of Core Cache: LOCAL, REPL_SYNC, REPL_ASYNC, INVALIDATION_SYNC, and INVALIDATION_ASYNC (see the main JBoss Cache reference documentation for details). The replication level is fine-grained and is performed automatically once the POJO is mapped into the internal cache store. When a POJO field is updated, a replication request will be sent out only to the key corresponding to that modified attribute (instead of the whole object). This can have a potential performance boost during the replication process; e.g., updating a single key in a big HashMap will only replicate the single field instead of the whole map! p.getName(); // is "old value"
In addition, operations under a transaction is batched. That is, the update is not performed until the commit phase. Further, if replication is enabled, other nodes will not see the changes until the transaction has completed successfully. Passivation. POJO Cache supports the same passivation provided by Core Cache. When a node mapped by POJO Cache has reached a configured threshold, it is evicted from memory and stored using a cache loader. When the node is accessed again, it will be retrieved from the cache loader and put into memory. The configuration parameters are the same as those of the Cache counterpart. To configure the passivation, you will need to configure both the eviction policy and cache loader. 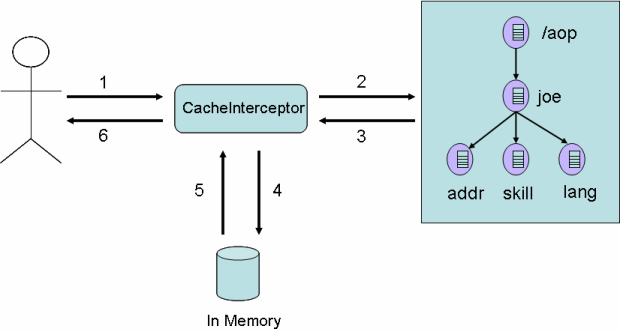 Object cache by reachability, i.e., recursive object mapping into the cache store. On attach, POJO Cache will attach all referenced objects as well. This feature is explained in more detail later. Natural Object Relationships. Java references are preserved as they were written. That is, a user does not need to declare any object relationship (e.g., one-to-one, or one-to-many) to use the cache. Object Identity. Object identity is preserved. Not only can a cached object be compared using equals(), but the comparison operator, ==, can be used as well. For example, an object such as Address may be multiple referenced by two Persons (e.g., joe and mary). The objects retrieved from joe.getAddress() and mary.getAddress() should be identicali, when when retrieved from a different node in the cluster then that which attached them. Inheritance. POJO Cache preserves the inheritance hierarchy of any object in the cache. 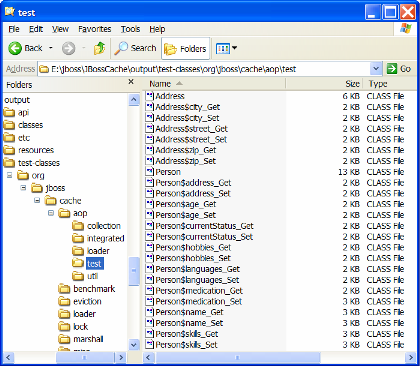 For example, if a Student class inherits from a Person class, once a Student object is mapped to POJO Cache (e.g., attach call), the fields in the base class Person are mapped as well. Collections. Java Collection types (e.g. List, Set, and Map) are transparently mapped using Java proxies. Details are described later. Annotation based. Starting from release 2.0, JDK 5 annotations are used to indicate that an object should be instrumented for use under POJO Cache (once attached). Transparent. Once a POJO is attached to the cache, subsequent object model changes are transparently handled. No further API calls are required. pcache.start(); // if toStart above is true, it will starts the cache automatically. pcache.stop(); // stop the cache. This will take PojoCache out of the clustering group, if any, e.g. pojocache.jar. Main POJO Cache library. jboss-aop-jdk50.jar. Main JBoss Aop library. javassist.jar. Java byte code manipulation library. trove.jar. High performance collections for Java. POJO Cache internally uses the JBoss Aop framework to both intercept object field access, and to provide an internal interceptor stack for centralizing common behavior (e.g. locking, transactions). 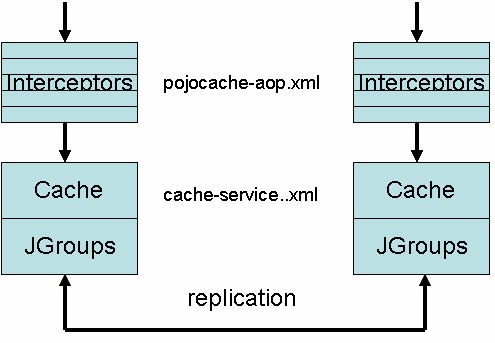 The following figure is a simple overview of the POJO Cache architecture. From the top, it can be can seen that when a call comes in (e.g., attach or detach), it will go through the POJO Cache interceptor stack first. After that, it will store the object's fields into the underlying Core Cache, which will be replicated (if enabled) using JGroups. The stack should be self-explanatory. For example, for the Attach stack, we currently have Start, CheckId, Tx, TxLock, and TxUndo interceptors. The stack always starts with a Start interceptor such that initialization can be done properly. CheckId is to ensure the validity of the Id (e.g., it didn't use any internal Id string). Finally, Tx, TxLock, and TxUndo are handling the the proper transaction locking and rollback behavior (if needed). POJO Cache currently uses JBoss AOP to intercept field operations. If a class has been properly instrumented (by either using the @Replicable annotation, or if the object has already been advised by JBoss AOP), then a cache interceptor is added during an attach() call. Afterward, any field modification will invoke the corresponding CacheFieldInterceptor instance. Below is a schematic illustration of this process. All access qualifiers are intercepted. In other words, all private, all protected, all default, and all public fields will be intercepted. Any field with final, static, and/or transient qualifiers, will be skipped. Therefore, they will not be replicated, passivated, or manipulated in any way by POJO Cache. The figure below illustrates both field read and write operations. Once an POJO is managed by POJO Cache (i.e., after an attach() method has been called), JBoss Aop will invoke the CacheFieldInterceptor every time a class operates on a field. The cache is always consulted, since it is in control of the mapped data (i.e. it gaurantess the state changes made by other nodes in the cluster are visible). Afterwords, the in-memmory copy is updated. This is mainly to allow transaction rollbacks to restore the previous state of the object. As previously mentioned, unlike a traditional cache system, POJO Cache preserves object identity. This allows for any type of object relationship available in the Java language to be transparently handled. During the mapping process, all object references are checked to see if they are already stored in the cache. If already stored, instead of duplicating the data, a reference to the original object is written in the cache. All referenced objects are reference counted, so they will be removed once they are no longer referenced. 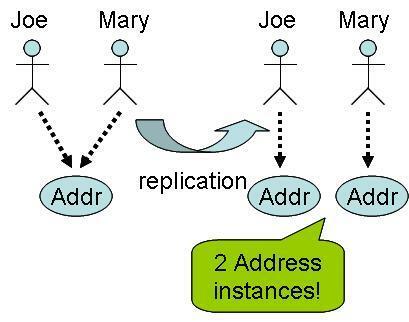 To look at one example, let's say that multiple Persons ("joe" and "mary") objects can own the same Address (e.g., a household). The following diagram is a graphical representation of the pysical cache data. As can be seen, the "San Jose" address is only stored once. In the following code snippet, we show programmatically the object sharing example. cache.attach("pojo/joe", joe); // add aop sanctioned object (and sub-objects) into cache. cache.attach("pojo/mary", mary); // add aop sanctioned object (and sub-objects) into cache. maryAddr = mary.getAddress(); // Should still have the address. If joe is removed from the cache, mary should still have reference the same Address object in the cache store. Person joe = cache2.find("pojo/joe"); // retrieve the POJO reference. Person mary = cache2.find("pojo/mary"); // retrieve the POJO reference. Address maryAddr = mary.getAddress(); // joeAddr and maryAddr should be the same instance!!! int zip = joeAddr.getAddress().getZip(); // Should be 95123 as well instead of 94086! POJO Cache preserves the inheritance hierarchy of all attached objects. For example, if a Student extends Person with an additional field year, then once Student is put into the cache, all the class attributes of Person are mapped to the cache as well. Following is a code snippet that illustrates how the inheritance behavior of a POJO is maintained. Again, no special configuration is needed. The previous sections describe the logical object mapping model. In this section, we will explain the physical mapping model, that is, how do we map the POJO into Core Cache for transactional state replication. However, it should be noted that the physical structure of the cache is purely an internal implementation detail, it should not be treated as an API as it may change in future releases. This information is provided solely to aid in better understanding the mapping process in POJO Cache. When an object is first attached in POJO Cache, the Core Cache node representation is created in a special internal area. The Id fqn that is passed to attach() is used to create an empty node that references the internal node. Future references to the same object will point to the same internal node location, and that node will remain until all such references have been removed (detached). The example below demonstrates the mapping of the Person object under id "pojo/joe" and "pojo/mary" as metioned in previous sections. It is created from a two node replication group where one node is a Beanshell window and the other node is a Swing Gui window (shown here). For clarity, multiple snapshots were taken to highlight the mapping process. The first figure illustrates the first step of the mapping approach. From the bottom of the figure, it can be seen that the PojoReference field under pojo/joe is pointing to an internal location, /__JBossInternal__/5c4o12-lpaf5g-esl49n5e-1-esl49n5o-2. That is, under the user-specified Id string, we store only an indirect reference to the internal area. Please note that Mary has a similar reference. Then by clicking on the referenced internal node (from the following figure), it can seen that the primitive fields for Joe are stored there. E.g., Age is 41 and Name is Joe Black. And similarly for Mary as well. 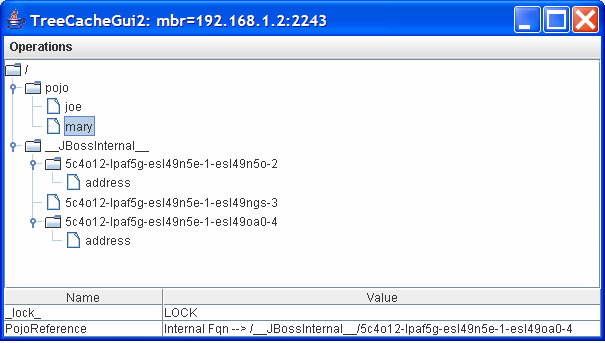 Under the /__JBossInternal__/5c4o12-lpaf5g-esl49n5e-1-esl49n5o-2, it can be seen that there is an Address node. Clicking on the Address node shows that it references another internal location: /__JBossInternal__/5c4o12-lpaf5g-esl49n5e-1-esl49ngs-3 as shown in the following figure. Then by the same token, the Address node under /__JBossInternal__/5c4o12-lpaf5g-esl49n5e-1-esl49na0-4 points to the same address reference. That is, both Joe and Mary share the same Address reference. Finally, the /__JBossInternal__/5c4o12-lpaf5g-esl49n5e-1-esl49ngs-3 node contains the various various primitive fields of Address, e.g., Street, Zip, and City. This is illustrated in the following figure. Create a Collection proxy instance and place it in the cache (instead of the original reference). The mapping of the Collection elements will still be carried out recursively as expected. If the Collection instance is referenced from another object, POJO Cache will swap out the original reference with the new proxy, so that operations performed by the refering object will be picked up by the cache. The drawback to this approach is that the calling application must re-get any collection references that were attached. Otherwise, the cache will not be aware of future changes. If the collection is referenced from another object, then the calling app can obtain the proxy by using the publishing mechanism provided by the object (e.g. Person.getHobbies()). If, however, the collection is directly attached to the cache, then a subsequent find() call will need to be made to retrieve the proxy. list.add("THREE"); // This won't be intercepted by the cache! // This will map the languages List automatically and swap it out with the proxy reference. proxyList.add("FOUR"); // proxyList has 4 elements still. As of PojoCache 2.0, HashMap keys must be serializable. Prior to PojoCache 2.0, HashMap keys were converted to String. This was fixed as you couldn't get the key back in its original form. See issue JBCACHE-399 for more details. This section provides a brief overview of the POJO Cache APIs. Please consult the javadoc for the full API. PojoCacheFactory provides a couple of static methods to instantiate and obtain a PojoCache instance. * Create a PojoCache instance. Note that this will start the cache life cycle automatically. * configure the underlying Cache instance. * Create a PojoCache instance. * @param start If true, it will start the cache life cycle. * @param config A configuration object that is used to configure the underlying Cache instance. PojoCache is the main interface for POJO Cache operations. Since most of the cache interaction is performed against the application domain model, there are only a few methods on this interface. * the system and fine-grained replication will be performed. * (for fine-grained operation) or object relationship will be maintained. * stored (e.g., replicated or persistent). If not, a PojoCacheException will be thrown. *             in the future release. E.g., "ben", or "student/joe", etc. * @param pojo object to be inserted into the cache. If null, it will nullify the fqn node. * @return Existing POJO or null if there is none. * @throws PojoCacheException Throws if there is an error related to the cache operation. As described in the above javadoc, this method "attaches" the passed object to the cache at the specified location (id). The passed in object (pojo) must have been instrumented (using the @Replicable annotation) or implement the Serializable interface. If the object is not instrumented, but serializable, POJO Cache will simply treat it as an opaque "primitive" type. That is, it will simply store it without mapping the object's fields into the cache. Replication is done on the object wide level and therefore it will not be fine-grained. If the object has references to other objects, this call will issue attach() calls recursively until the entire object graph is traversed. In addition, object identity and object references are preserved. So both circular and multiply referenced objects are mapped as expected. The return value after the call is the previous object under id, if any. As a result, a successful call i will replace that old value with the new instance. Note that a user will only need to issue this call once for each top-level object. Further calls can be made directly on the graph, and they will be mapped as expected. * Remove POJO object from the cache. * @param id Is string that associates with this node. * @return Original value object from this node. This call will detach the POJO from the cache by removing the contents under id and return the POJO instance stored there (null if it doesn't exist). If successful, further operations against this object will not affect the cache. Note this call will also remove everything stored under id even if you have put other plain cache data there. * Retrieve POJO from the cache system. Return null if object does not exist in the cache. * Note that this operation is fast if there is already a POJO instance attached to the cache. * @param id that associates with this node. * @return Current content value. Null if does not exist. This call will return the current object content located under id. This method call is useful when you don't have the exact POJO reference. For example, when you fail over to the replicated node, you want to get the object reference from the replicated cache instance. In this case, PojoCache will create a new Java object if it does not exist and then add the cache interceptor such that every future access will be in sync with the underlying cache store. * under the children of the id. That is, we don't mix the id with different POJOs. * @param id The starting place to find all POJOs. * @return Map of all POJOs found with (id, POJO) pair. Return size of 0, if not found. This call will return all the managed POJOs under cache with a base Fqn name. It is recursive, meaning that it will traverse all the sub-trees to find the POJOs under that base. For example, if you specify the fqn to be root, e.g., "/" , then it will return all the managed POJOs under the cache. Since POJO Cache uses Core Cache for the underlying node replication, transaction, locking, and passivation behavior, the configuration is mostly the same. When a PojoCache instance is obtained from a PojoCacheFactory, it is required that the either a org.jboss.cache.config.Configuration object is passed, or more typically a String indicating the location on the classpath or filesystem of an xml configuration file is provided. In the latter case, PojoCacheFactory will parse the xml to create a Configuration. PojoCache will simply pass the resulting Configuration to the underlying Core Cache implementation. For details on the configuration please see the "Configuration" chapter in the the JBoss Cache User Guide. A common use-case is to configure the underlying Core Cache to enable passivation. Passivation is a feature used to reduce cache memory usage by evicting stale data that can later be reloaded. In JBoss Cache, it is done via a combination of an eviction policy and a cache loader. That is, when a node is evicted from the Cache's in-memory store, it will be stored in a persistent store by the cache loader. When the node is requested again, it will be loaded from the persistent store and stored into memory. There is a restriction, however. Since POJO Cache maps object data into an internal area, there are two places that have object information. One is under the regular String ID that the user specifies, and the other is located under /__JBossInternal__. Therefore, to maintain consistentency, when you specify the eviction region, you can only specify one global (i.e., /_default_) region. This way, when the nodes associated with a POJO are passivated, they will do so across the whole region. Below is a snippet from a cache configuration xml illustrating how the eviction policy along with cache loader can be configured. Please note that this is simply an aspect of the underlying Cache. That is, PojoCache layer is agnostic to this behavior. <!-- only one cache loader in the chain may set fetchPersistentState to true. Another way to support multiple regions in eviction is to use region-based marshalling. See the "Architecture" chapter in the JBoss Cache User Guide for more information on region-based marshalling. When the Cache uses region-based marshalling, POJO Cache will store internal node data on the region that is specified. This allows for a more flexible eviction policy. POJO Cache supplies a pojocache-aop.xml that is required to be set via a system property: jboss.aop.path during compile- or load-time, or placed in the user's classpath. The file now consists of the interceptor stack specification, as well as annotations for POJO instrumentation. It is listed fully in the Appendix section. Note that the file should not normally need to be modified. Only an advanced use-case would require changes. Simply instantiate a PojoCacheFactory and invoke one of the overloaded createCache methods shown in the API Overview. If PojoCache is run in JBoss AS then your cache can be deployed as an MBean simply by copying a standard cache configuration file to the server's deploy directory. The standard format of PojoCache's standard XML configuration file (as shown in the Appendix) is the same as a JBoss AS MBean deployment descriptor, so the AS's SAR Deployer has no trouble handling it. Also, you don't have to place the configuration file directly in deploy; you can package it along with other services or JEE components in a SAR or EAR. In AS 5, if you're using a server config based on the standard all config, then that's all you need to do; all required jars will be on the classpath. Otherwise, you will need to ensure pojocache.jar, jbosscache.jar and jgroups-all.jar are on the classpath. You may need to add other jars if you're using things like JdbmCacheLoader. The simplest way to do this is to copy the jars from the PojoCache distribution's lib directory to the server config's lib directory. You could also package the jars with the configuration file in Service Archive (.sar) file or an EAR. Note in the example the value of the mbean element's code attribute: org.jboss.cache.pojo.jmx.PojoCacheJmxWrapper. 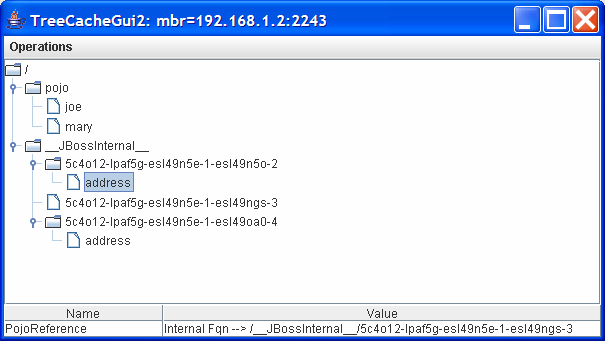 This is the class JBoss Cache uses to handle JMX integration; the PojoCache itself does not expose an MBean interface. See the JBoss Cache MBeans section for more on the PojoCacheJmxWrapper. 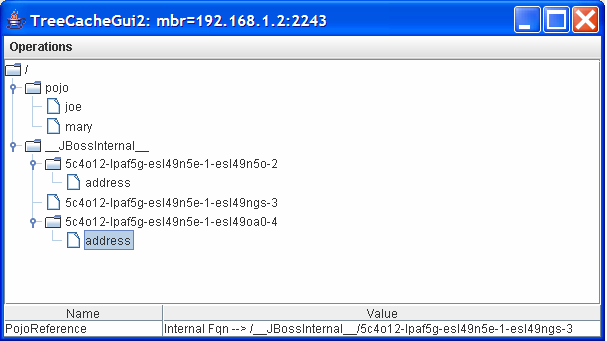 The MBeanServerLocator class is a helper to find the (only) JBoss MBean server inside the current JVM. The javax.management.MBeanServerInvocationHandler class' newProxyInstance method creates a dynamic proxy implementing the given interface and uses JMX to dynamically dispatch methods invoked against the generated interface to the MBean. The name used to look up the MBean is the same as defined in the cache's configuration file. Once the proxy to the PojoCacheJmxWrapper is obtained, the getPojoCache() will return a reference to the PojoCache itself. Beginning with AS 5, JBoss AS also supports deployment of POJO services via deployment of a file whose name ends with -beans.xml. A POJO service is one whose implementation is via a "Plain Old Java Object", meaning a simple java bean that isn't required to implement any special interfaces or extend any particular superclass. A PojoCache is a POJO service, and all the components in a Configuration are also POJOS, so deploying a cache in this way is a natural step. Deployment of the cache is done using the JBoss Microcontainer that forms the core of JBoss AS. JBoss Microcontainer is a sophisticated IOC framework (similar to Spring). A -beans.xml file is basically a descriptor that tells the IOC framework how to assemble the various beans that make up a POJO service. The rules for how to deploy the file, how to package it, how to ensure the required jars are on the classpath, etc. are the same as for a JMX-based deployment. Following is an abbreviated example -beans.xml file. The details of building up the Configuration are omitted; see the "Deploying JBoss Cache" chapter in the JBoss Cache User Guide for a more complete example. If you look in the server/all/deploy directory of an AS 5 installation, you can find several more examples. An interesting thing to note in the above example is the difference between POJO Cache and a plain Cache in the use of a factory to create the cache. (See the "Deploying JBoss Cache" chapter in the JBoss Cache User Guide for the comparable plain Cache example.) The PojoCacheFactory exposes static methods for creating a PojoCache; as a result there is no need to add a separate bean element for the factory. Core Cache's DefaultCacheFactory creates caches from a singleton instance, requiring a bit more boilerplate in the config file. Get a reference to the underlying PojoCache. Invoke create/start/stop/destroy lifecycle operations on the underlying PojoCache. See numerous details about the cache's configuration, and change those configuration items that can be changed when the cache has already been started. See the PojoCacheJmxWrapperMBean javadoc for more details. It is important to note a significant architectural difference between PojoCache 1.x and 2.x. In 1.x, the old TreeCacheAop class was itself an MBean, and essentially exposed the cache's entire API via JMX. In 2.x, JMX has been returned to it's fundamental role as a management layer. The PojoCache object itself is completely unaware of JMX; instead JMX functionality is added through a wrapper class designed for that purpose. Furthermore, the interface exposed through JMX has been limited to management functions; the general PojoCache API is no longer exposed through JMX. For example, it is no longer possible to invoke a cache attach or detach via the JMX interface. If a PojoCacheJmxWrapper is registered, the wrapper also registers MBeans for the underlying plain Cache and for each interceptor configured in the cache's interceptor stack. These MBeans are used to capture and expose statistics related to cache operations; see the JBoss Cache User Guide for more. They are hierarchically associated with the PojoCacheJmxWrapper MBean and have service names that reflect this relationship. For example, a plain Cache associated with a jboss.cache:service=PojoCache will be accessible through an mbean named jboss.cache:service=PojoCache,cacheType=Cache. The replication interceptor MBean for that cache will be accessible through the mbean named jboss.cache:service=PojoCache,cacheType=Cache,cache-interceptor=ReplicationInterceptor. Simplest way to do this is to create your PojoCache and pass it to the PojoCacheJmxWrapper constructor. When you deploy your cache in JBoss AS using a -service.xml file, a PojoCacheJmxWrapper is automatically registered. There is no need to do anything further. The PojoCacheJmxWrapper is accessible through the service name specified in the cache configuration file's mbean element. As mentioned above, the cache exposes a variety of statistical information through its MBeans. It also emits JMX notifications when events occur in the cache. See the JBoss Cache User Guide for more on the statistics and notifications that are available. The only PojoCache addition to the plain JBoss Cache behavior described in the User Guide is that you can register with the PojoCacheJmxWrapper to get the notifications. There is no requirement to figure out the ObjectName of the underlying cache's CacheJmxWrapper and register with that. In this chapter, we explain how to instrument (or "aspectize") the POJOs via JBoss Aop. There are two steps needed by JBoss Aop: 1) POJO declaration, 2) instrumentation. But depends on the instrumentation mode that you are using, you may not need to pre-process your POJO at all. That is, if you use JDK5.0 (required) and load-time mode, then all you need to do is annotating your POJO (or declare it in a xml file). This makes your PojoCache programming nearly transparent. For the first step, since we are using the dynamic Aop feature, a POJO is only required to be declared "prepare". Basically, there are two ways to do this: either via explicit xml or annotation. As for the second step, either we can ask JBoss Aop to do load-time (through a special class loader, so-called load-time mode) or compile-time instrumentation (use of an aopc pre-compiler, so-called precompiled mode). Reader can read the JBoss Aop introduction chapter for more details. To declare a POJO via XML configuration file, you will need a META-INF/jboss-aop.xml (or in the PojoCache case, it is the equivalent pojocache-service.xml file located under the class path or listed in the jboss.aop.path system property. JBoss AOP framework will read this file during startup to make necessary byte code manipulation for advice and introduction. Or you can pre-compile it using a pre-compiler called aopc such that you won't need the XML file during load time. JBoss Aop provides a so-called pointcut language where it consists of a regular expression set to specify the interception points (or jointpoint in aop parlance). The jointpoint can be constructor, method call, or field. You will need to declare any of your POJO to be "prepared" so that AOP framework knows to start intercepting either method, field, or constructor invocations using the dynamic Aop. For PojoCache, we only allow all the fields (both read and write) to be intercepted. That is, we don't care for the method level interception since it is the state that we are interested in. So you should only need to change your POJO class name. For details of the pointcut language, please refer to JBoss Aop. The instanceof operator declares any sub-type or sub-class of the specific POJO will also be "aspectized". For example, if a Student class is a subclass of Person , JBossAop will automatically instrument it as well! We intercept the field of all access levels (i.e., private , protected , public , etc.) The main reason being that we consider all fields as stateful data. However, we can relax this requirement in the future if there is a use case for it. We don't intercept field modifiers of final and transient though. That is, field with these modifiers are not stored in cache and is not replicated either. If you don't want your field to be managed by the cache, you can declare them with these modifiers, e.g., transient. Annotation is a new feature in Java 5.0 that when declared can contain metadata at compile and run time. It is well suited for aop declaration since there will be no need for external metadata xml descriptor. Basically, it simply states that any annotation with both marker interfaces will be "aspectized" accordingly. The above declaration will instrument the class Person and all of its sub-classes. That is, if Student sub-class from Personal, then it will get instrumented automatically without further annotation declaration. In Release 2.0, we have added two additional field level annotations for customized behavior. The first one is @org.jboss.cache.pojo.annotation.Transient. When applied to a field variable, it has the same effect as the Java language transient keyword. That is, PojoCache won't put this field into cache management (and therefore no replication). The second one is @org.jboss.cache.pojo.annotation.Serializable, when applied to a field variable, PojoCache will treat this variable as Serializable, even when it is Replicable. However, the field will need to implement the Serializable interface such that it can be replicated. g2.getResource(); // This is should be null because of @Transient tag so it is not replicated. ge.setSpecialAddress(d2); // Now this will. As already mentioned, a user can use the aop precompiler (aopc) to precompile the POJO classes such that, during runtime, there is no additional system class loader needed. The precompiler will read in pojocache-aop.xml and weave the POJO byte code at compile time. This is a convenient feature to make the aop less intrusive. Below is an Ant snippet that defines the library needed for the various Ant targets that we are listing here. User can refer to the build.xml in the distribution for full details. In JDK5.0, you can use the javaagent option that does not require a separate Classloader. Here are the ant snippet from one-test-pojo, for example. Below is the code snippet for the aopc Ant target. Running this target will do compile-time weaving of the POJO classes specified. Below is a snapshot of files that are generated when aopc is applied. Notice that couple extra classes have been generated because of aopc. We have maintained a PojoCache wiki troubleshooting page. Please refer it first. We will keep adding troubleshooting tips there. All the current outstanding issues are documented in JBossCache Jira page . Please check it for details. If you have discovered additional issues, please report it there as well. The example POJO classes used for are: Person, Student, and Address. Below are their definition (note that neither class implements Serializable ) along with the annotation. Below is a sample xml configuration for Cache that you can use for PojoCache creation. Attached is a full listing for pojocache-aop.xml. not need to modify this file. This defines the PojoCache 2.0 interceptor stack. Unless necessary, don't modify the stack here! The following section should be READ-ONLY!! It defines the annotation binding to the stack. in his POJO. There will be no need of jboss-aop.xml from user's side.